Extreme population cycles are some of the most interesting aspects of life in the north. One year, a species may be quite sparse, and then a year or two later it is hard to avoid it. Charles Elton, who virtually founded modern population ecology with his study of vole, mice, hare, and lemming cycles in Spitsbergen and Canada during the 1930s and 1940s, called these cycles “the generous rhythm of the north.” But the causes of these population cycles and why they are so extreme in the north are still some of the largest unsolved problems in ecology. Although the best known cycles involve animals and their predators, plant populations also have their ups and downs. One of the more interesting plant species with population cycles is wild rice, Zizania palustris, a different plant altogether than the tropical white or brown rice, Oryza sativa. Wild rice, an annual aquatic graminoid, forms large and almost monotypic stands in ponds, lakes, and streams that are no more than two feet but no less than one foot deep with a slight current and with a silty bottom. Wild rice is every bit a symbol of the North Woods as are loons, moose, beavers, wolves, and white pine. Wild rice is an important staple and sacred food members of the Ojibwe people who believe they were led to Minnesota and Wisconsin “where grain grows upon the waters”, the grain being wild rice and the waters being the thousands of inland glacial lakes drained by rivers flowing into Lake Superior. Over many hundreds of years, tribal members have watched wild rice populations wax and wane as very productive populations one year crash to one fifth the density of stems the next. During the next three years, the populations slowly recover their productivity, whereupon there follows another crash. In order to maintain a sustainable harvest of rice for the coming winter, the Ojibwe set up their ricing camps on the most productive lakes each year. During the ricing moon of September, one man stood and poled his canoe from the stern while his partner, often his wife, son, or daughter, sat in the bow bending a bunch of stems over the gunwales with one stick and knocking the seeds off with another. When the wild rice in this year’s lake crashed the following year, the tribes would move to another lake which was now at the peak of the cycle. The Ojibwe semi-nomadic life style was tuned to the rhythm of wild rice population cycles. Why do wild rice populations rise and fall on a four year cycle? One obvious possibility is that the boom-and-bust cycle is being driven by a similar cycle in water table fluctuations. Indeed, raising of the water table kills wild rice plants by drowning the seedlings before their shoots emerge from the water surface. This was a serious problem for the Ojibwe during the days of white pine lumbering, when loggers built small dams for log driving and flooded out many wild rice beds the Indians required for sustenance. While such changes in water tables certainly affect wild rice production in individual years, they cannot explain the four to five year cycles because water tables do not fluctuate on cycles that short. Moreover, in some lakes large enough to support several stands of wild rice, often in separate bays, the productivity of some stands might be increasing while others are declining in the very same year, and yet the water table is the same throughout the lake. To look for a possible cause of wild rice cycles, we might look more closely at what limits the growth of plants. Studies by Peter Lee and colleagues at Lakehead University in Thunder Bay have shown that the growth of wild rice appears to be limited by the supply of nutrients, particularly nitrogen, from sediments. Since wild rice is an annual plant and does not have a large perennial root system to store nutrients over the winter, its nutrient requirements must be met each year from the sediments or water column. Wild rice takes up most of the nitrogen it needs for a given year’s growth during a relatively brief period of time in the spring and early summer. The nitrogen is used first in leaves for photosynthesis, then later moved into the grain in the form of protein during ripening in late August and September. Perhaps the supply of nitrogen from the sediments also fluctuates? In fact, Keenan and Lee have shown that nitrogen availability in the sediments appears to be high during those years when the wild rice is productive and low during the crashes. So what causes the availability of nitrogen to fluctutate? It turns out that the dead wild rice litter from prior generations might be the culprit. Almost all of the nitrogen in litter is bound into carbon compounds. This nitrogen is not immediately available to the next generation of plants when the litter is returned to the sediments. Instead, the nitrogen, which is bound in proteins and other compounds is released only after the microbes begin to decompose the dead litter and convert the nitrogen to dissolved forms (mainly ammonium and sometimes nitrate) that plant roots can take up. This process is familiar to most gardeners: kitchen scraps and lawn rakings must sit for a while in a compost pile to decay to the point where their nutrients are being released before the compost can be applied to the garden. Otherwise, applying compost too soon does no good. It is only when the organic matter is well-decomposed that the microbes begin to release it back into the soil or sediment in forms the plants can take up. Wild rice litter is difficult for microbes to decompose for two reasons. First, in early August, the plant begins to senesce and nitrogen is moved out of leaves and stems into the maturing seeds, leaving the stems and leaves with low nitrogen concentrations. High nitrogen concentrations in the seeds enhance their germination success the following year. Second, the seed head is very heavy, especially during a productive year when it can contain as many as 50 large seeds. Supporting this seed head requires a stiff stem. The stiffness comes from a large amount of tough and nitrogen poor lignin and cellulose. Nitrogen poor litter that is high in lignin and cellulose is very difficult for microbes to decompose: the microbes themselves need nitrogen and the carbon bonds in cellulose and lignin are strong and require much energy to break. The microbes decomposing the litter do not begin to release the nitrogen back into the sediment and water column until at least the end of the following summer, or even two years later. Imagine a productive year in a wild rice stand in which a lot of stem and leaf biomass is produced. When the plant dies, the stem and leaf litter is deposited on the sediments during late fall and begins to decay when the sediments warm the following spring. The previous productive year also produces a large number of seeds that are germinating; the seedlings that emerge from the seed need a lot of nitrogen in a hurry to supply their growth. But the nitrogen which is locked up in all that litter is not being release in synchrony with the timing of nutrient demand by the next generation of seedlings. Starved for nitrogen, many of the seedlings die and the population crashes to a low level that year and only a small amount of seeds and new plant biomass are produced. The following year, the large previous crop of litter is now well-decomposed and the nitrogen is being released for the next generation of plants. Seedling survival and growth are greater, and so productivity begins to recover until eventually we get another productive year producing another large crop of litter and the cycle repeats itself. The delay in nitrogen release from each year’s litter causes the population to cycle from generation to generation. As with all organisms, natural selection favors those individuals with traits that enhance the production of viable progeny. 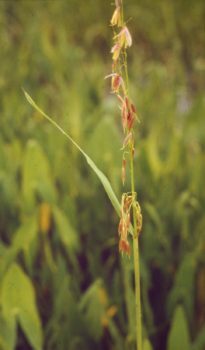 Supporting an abundant crop of heavy seeds at the end of a stiff stem until they are mature and moving nitrogen out of leaves and stems into the seeds where it will improve germination success the following year are traits that would appear to enhance the reproductive potential of wild rice. But these two traits come at a cost, and that cost is the slow decay of litter and the subsequent delay in the release of nitrogen to the next generation. A generation that has produced an abundance of heavy seeds has also produced an abundance of nitrogen poor and slowly decomposing litter that starves the next generation’s seedlings of the nitrogen they need to grow. The same traits that enhance reproductive success also seem to inhibit it to some extent. Natural selection must strike a balance between these two opposing outcomes of the same set of traits. In the case of wild rice, the balance seems to work in favor of sustaining the population, but it comes at a cost of extreme population cycles. In nature, there is no free lunch. Keenan, T.J. and P.F. Lee. 1988. Ecological relationships of wild rice, Zizania aquatica. 7. Sediment nutrient depletion following introduction of wild rice to a shallow boreal lake. Canadian Journal of Botany 66: 236-241. Previous Previous post: When did Darwin become a scientist?